Long before microwaves, electric stoves and refrigerators, food was prepared in clay pots and iron kettles over hot coals and preserved by smoking and salt curing. This Thanksgiving holiday, explore foodways of 17th- and 18th-century Virginia during “Foods & Feasts of Colonial Virginia,” a three-day event beginning on Thanksgiving Day. Discover how food was gathered, preserved and prepared on land and at sea by Virginia’s English colonists and Powhatan Indians. Enjoy cooking demonstrations throughout the day in the re-created Powhatan Indian village, 1610-14 fort and at the ships’ pier. s and the variety of dishes in which it was used, including corncakes and corn dumplings. 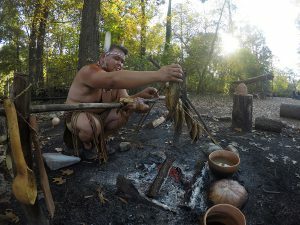 Throughout the day, visitors also can learn how Powhatan Indians made stone and bone tools used to obtain and prepare food, as well as learn about Powhatan hunting techniques. 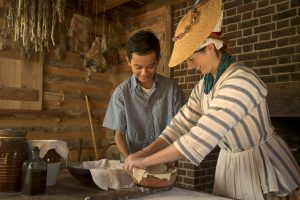 Within the re-created 1610-14 fort, food preparation will reflect the culinary skills English colonists brought to Virginia. 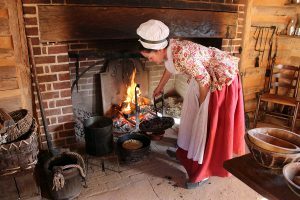 Historical interpreters will bake bread in a cloame oven on all three days and throughout the event will demonstrate open-hearth cooking of pudding, pies and pottage, based on historical recipes of the late 16th and early 17th centuries. Museum visitors also can experience European military tactics and drills near the fort. At the ships’ pier, a special program will allow visitors to haul cargo from a replica of one of the three ships that brought America’s first permanent English colonists to Virginia in 1607 to learn how the colony was provisioned. Throughout the day, visitors can explore typical sailors’ fare of salted fish, biscuit and dried foods and try making the most common food – a ship biscuit. A daily program on celestial navigation at 12 noon will explore how 17th-century sailors steered by the stars. “Evolution of America: 1619 to Today,” a one-hour documentary of the 2019 Commemoration, American Evolution, will be shown in Jamestown Settlement’s Presentation Hall. The documentary explores the events and issues of 1619 and demonstrates the effects that year had on the growth and development of the United States, which still resonate today. It will air on PBS stations nationwide beginning in January 2019. The year 1619 was a pivotal year in the establishment of the first permanent English Colony in North America because of four key historical events that year: the first representative legislative assembly in the New World, the arrival of the first recorded Africans to English North America, the recruitment of English women in significant numbers, and the first official English Thanksgiving in North America. 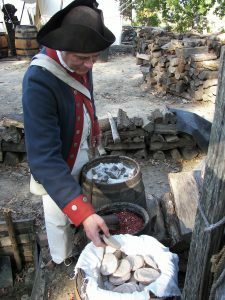 Visitors to the re-created Continental Army encampment can learn about meager rations of dried beans, salted meat and hard bread that soldiers had to try to turn into nourishing soups and stews. Daily artillery drills will show visitors how soldiers earned their rations. Plundering and theft sometimes occurred when rations were scarce, and a daily program will illustrate the consequences. At the re-created Revolution-period farm, visitors can witness the bounty of field and garden transformed into stews, pies and breads. 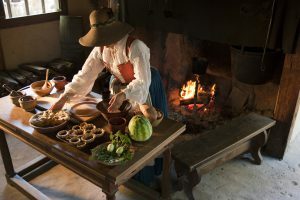 A variety of dishes will be prepared daily until 4 p.m. in the farm kitchen using 18th-century open-hearth cooking techniques and recipes. Visitors also can learn about 18th-century herbal remedies for indigestion. Food preparation in the museums’ outdoor living-history areas is for demonstration purposes only. The Jamestown Settlement Cafe will offer a traditional Thanksgiving dinner, offered on a first-come, first-served basis, from 11 a.m. to 4 p.m. on Thanksgiving Day, November 28. A combination ticket – available online only – offers seven days of unlimited admission to both museums at $26.00 for adults and $12.50 for ages 6 through 12. Additional multi-attraction holiday ticket and package options are available. A combination ticket for one visit to both museums is $26.00 for adults and $12.50 for ages 6-12, a 20 percent savings on individual museum admission. Admission to Jamestown Settlement is $17.50 for adults and $8.25 for ages 6-12, and to the American Revolution Museum at Yorktown, $15.00 for adults and $7.50 for ages 6-12. Children under 6 are free. In time for holiday shopping, museum gift shops offer a selection of books, prints, museum reproductions, educational toys, games and souvenirs relating to the 17th and 18th centuries. Admission is not required to visit the museum gift shops, open 9 a.m. to 5 p.m. daily. Shop online.